Mounts to 16” diameter by 6" wide, dual-rear-wheel, 6 hand hole, 5 lug on 208mm bolt circle, 30mm lug stud Mitsubishi applications. Phoenix USA Inc. DOT over-lug, bolt-on, stud/bracket mount wheel simulators with polished stainless steel finish. Front simulators dish out and rear simulators are deep dished to contour with the wheel. 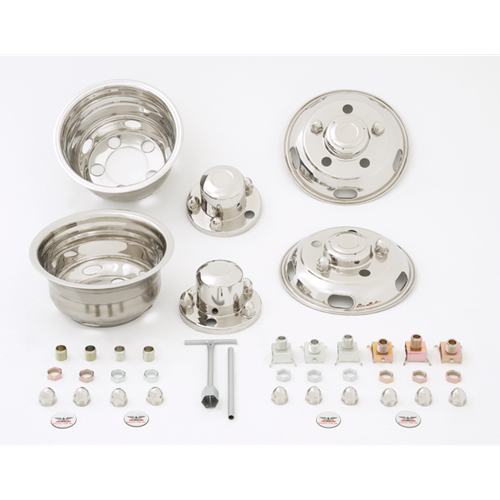 Set of 4 wheel covers including mounting hardware, installation tool, and instruction sheet.